I don't believe I ever saw this picture of Christi before and since she enjoyed "exploring in the lab" with her father, I'm willing to bet he snapped this picture while I was at class one night. Regardless, I just found it and I love it! What a riot she was always goofing around making us laugh! I know Shayne really misses conducting science experiments with her. On the day that Cedar Point closes for the season, I feel I must post a couple pictures of Christi at CP as a little tyke. 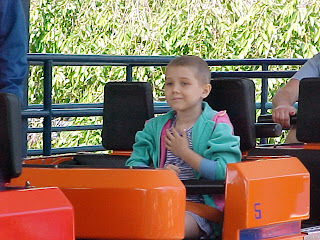 My how she loved that amusement park!! Today, just really missing Christi!!! Perhaps it is that trick or treating is this week, or also that it will soon be "All Souls Day" a day to pray for the souls of deceased loved ones. I don't know. After church we went to visit with my grandma Falter. Shayne kept asking great questions getting grandma to really open up about their farm, their horses and the one room school house she went to in Reedtown. It was wonderful; I just kept thinking Christi would have also been "all ears" just as she would have been excited to see her sweet friend in church. (PHOTO: Jan. 2004: Christi & Buttercup. Buttercup continues to thrive; what I wouldn't do to trade her in for Christi, smile!!) 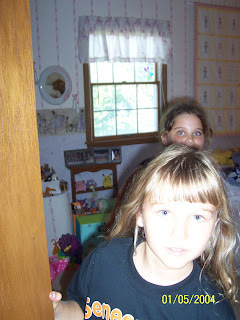 We have always teased the girls that we do not like their cats. During the days of Christi's funeral, Shayne and I kept trying to lighten the mood and we were saying things such as, "Didn't the Egyptians bury their cats with the kings?" They haven't closed Christi's coffin lid yet, there's still time! I remember reading that you might have wanted some things to put on her plaque, and while this might be too long, I wrote this poem for Christi and wanted to send it to you. She was so wonderful, and this poem can't even begin to describe how amazing she was. And now, 9 years later, she's resting in Heaven. And she still will be doing so, though she's not here on Earth. Like the sun in the sky, or a breeze in the air. and know Christi's with God, looking down with such love. We can always be sure she's in a better place. God only takes the ones that He loves so dear. My dearest Angela.............with all due respect to Oh(dot the i )O, may we have the honor of showing you what true tailgating is all about? : ) We will be at the Penn State vs Ohio game on Saturday and we would just love for you to join us..........is there any chance you can come???????? We would just love it! What Sylvia didn't know was that days before Shayne and I were sitting "in the shoe" saying how much we would love to drive to Penn to tailgate with Sylvia and her family!! Unfortunately, my coursework load is extremely heavy right now and I cannot allow myself to take the time off from studying, but....since a sweet blogger did indeed ask me for the candy buckeye recipe this week, I thought I'd share it here. They were Christi's favorite candies and they taste almost like Reese's Peanut Butter Cups, enjoy! When the "CP Ticket Winner" (smile) told me she would be bringing three college students with her to CP this weekend, I realized I needed to send $10.00 to pay for their parking. It's included with the season passes, but college students don't have $10 sitting around. I decided Christi would most likely want to help out so I went to her (untouched) purse and took out the little paper wallet she made. It was "bursting" with lots of ones!! With tears pouring down my cheeks, thinking of Christi and all of the sweet angels who helped us out for so long, I took out $10.00 and mailed it off with the tickets. It felt wonderful finally being able to do something nice for someone else! Thank you for the donation from Christi's Memorial Fund for new supplies in the Early Childhood Classroom. Back in September, we had donated $500 from the Christi Thomas Memorial Fund for the Education Department to purchase some needed items. Their sign with the many personalized signatures on it, now hangs on our kitchen wall! I love it! THANK YOU! It was bittersweet to walk out tonight. Many of the sweet students gave me hugs and thanks as they left. Because I will be teaching a graduate class for Ohio State (Middle Childhood Language Arts) starting in January, I won't return to the wonderful Heidelberg until summer when I'm scheduled to teach a grad class. The students and faculty at the Berg are absolutely amazing and I have been blessed beyond belief to have had the past five semesters of working and learning from and with them. God is good! Go Berg!! Wow! We're simply shocked so many would be reading Christi's blog and so many would email with CP ticket requests. I thought I'd better post "we've got a winner" before we head off to school this morning so no one else was scrambling to check their calendars. The first email in came within minutes of when I actually posted the blog. Congratulations to one of Christi's former dance teachers and winner of one of the $1,000 scholarships. She's going to take some friends to Cedar Point this weekend! I hope they have great weather and a grand time! After my last "OSU football stuff" on the blog, we received the sweetest email and an invitation to tailgate prior to the next game. Well, we'd never turn down a party invitation (wink)....seriously, we went to their website and thought we'd have to check out this party. What a pleasure to get to meet this beautiful wonder mom who emailed! When I asked her how she found out about Christi, she told us that each year on her son's birthday she writes a letter to him about the happenings on his birthday and the year. 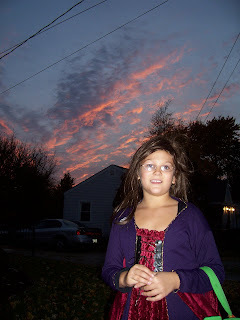 The first thing she found when she googled "Sept. 19, 2006" was Christi Thomas. Amazing, eh? Regardless, I'm so glad her son brought us together and I think this letter idea is a grand one all parents should endorse! Today, when we renewed our season passes for next year at Cedar Point, we received three free tickets to be used next weekend. We have season passes and don't plan on returning again next weekend anyway so we'd like to give them away to the first "blogger" who emails. (They are valued at $42.95 each so if you've ever wanted to try one of Christi's favorite places, here's your chance while it is free!) I will drop them in the mail to the first person who emails me: zzartset@bright.net Cedar Point is located in Sandusky and is open this Friday from 6PM to midnight, Saturday from noon to midnight and the final day of the season is Sunday (10AM to 6PM). This morning we went to the shrine before going to Cedar Point. With temps in the low 80s today and with the sun shining, it was gorgeous! Shayla asked if she could light at candle for Christi at one of the chapels along the outdoor walking area. We thought it was sweet she asked without us asking her if she wanted to light a candle for her sister. We most often include Christi when in prayer, perhaps Shayla does too. Now that we have official OSU attire, we looked like real OSU fans! We enjoyed another great game in the shoe. Everyone keeps telling us how awesome our seats are and we keep joking, "Can anyone have any more hours than I do and still not have that degree?" A girl in one of my classes told me, "I work in the ticket office and my seats are no where near yours! How did you do that?" Perhaps it wasn't my 133 hours, but my little angel working her special magic...? She did name her cat, Buckeye. Unfortunately, I'm not yet able to upload any of the photos of Shayla (bummer. Marty got some great shots!). She had a fabulous time with her aunt and uncle while we were at the game. We'd like to thank those sweet teachers from Central Ohio and to Shayne's friends at a bank in Columbus; we had a lovely time tailgating with them too!! I never understood what "tailgating" was before, but after walking pass hundreds of RVs and see tons of OSU flags and fans the past two Saturdays, I think I understand now. (It's just too much food, music, scarlet and gray and beverages all in OSU style....and hundreds of good spirited and crazy fans!) We wish Shayla could have been with us - at least to see all of the "festivities" before the game! She would have been "wide-eyed" and giggling, just like Christi would have too! I recently came across Christi's 3rd grade school journal. 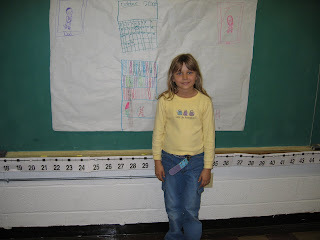 She wrote these items when she was seven and in the same teacher's class as Shayla is now in. I make lots of new friends. All different kinds, short and tall. Everybody that was in my class last year, is in my class this year. Those are my old friends. 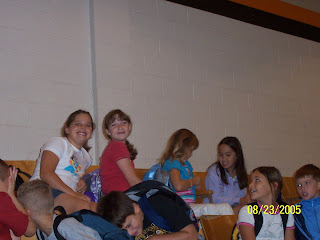 My new friends were in the other second grade and that is nice about new friends. My favorite sandwich is bologna and cheese on plain white bread with a lot of cheese. Cold bologna without the crust is best. 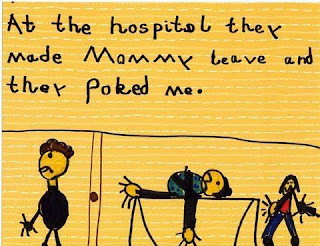 I now see that it was some time in 3rd grade when she started dotting her i's with that precious little heart, instead of a dot, she continued until her death. I feel excited when I am about to get a surprise. Once when I got a surprise it was milk and cookies! I could keep a cat in my office. I will make great money. I am good with pets. NO: I might have to get up at night to cure emergencies. I won't see my family as much because I'll be working. I'd also have to be like a dentist to animals. PHOTO: October 04 (age 7) While sitting and crying in Christi's room on Sunday, I picked up a quiz / journal style book. I had to show Shayne the part where she wrote she was most comfortable in her bedroom and two people she could always go and talk to were "mom" and "dad". Somehow I think our little angel knew I needed some comfort and led me to picking up that special book. Goodbye! We want to play - without you (smile). A Christi Art Project; I LOVED this!! I received a request to post the Power Point about Christi that Christi was working on. I am embarassed to admit I had forgotten all about it, but I went in her folder on our computer and I see she last worked on this on September 2nd 2006 so here it is. (She died on the 19th.) It wasn't quite finished and I'm certain the 9 year old perfectionist wouldn't want me to share it without it being "finished" but so much in Christi's life wasn't finished, according to my standards. I still walk pass her unfished art and craft projects in her untouched bedroom and it still breaks my heart. I had just exposed her to PPT and she was having a lot of fun learning how to use it. Thank you so very, very much for all of the kind comments posted about her "11 German Shepherds" video. That "production" really meant a lot to her and your comments meant a lot to me - THANKS! Shayla also had an incredible Saturday afternoon. She went with her great aunt and uncle (Marty & Jeff) to the Quarter horse Congress, also in Columbus. I guess it's one of the largest horse shows in the world. She was able to watch horses jump - something she'd been wanting to see and she also helped aunt Marty select a saddle for Dolly. This afternoon I will be taking her back to Heidelberg College to finish watching "South Pacific". She LOVED it Thursday night, but at intermission it was 9:30 PM so I said we had to get home to get her to bed. She was so sad, she nearly cried. We borrowed the CD of the tunes from the library and had been looking forward to it all of last week. My deepest thanks to Jason!! (Some may remember him as the "Mad Hatter" at Christi's Tea Party, well what a sweetheart he is!) He met me at COSI on Sunday and took the DVD hardcopy of the Christi's final day in Ohio, when she wrote and made her video "11 German Shepherds", and he went to house and somehow figured out how to get it on the blog. While Christi wasn't feeling "the greatest" that day she was very happy about writing, directing, making the signs for and acting in this little play she put together (along with her crazy family). It was definitely this little girl's "last hurrah". The next day I emailed my mom and aunt Marty saying, "It's a good thing we made that movie yesterday, today she cannot get off of the couch; she's in so much pain. She feels horrible." It's 9 minutes and Shayne and Uncle Jeff act pretty goofy in it, but it was like a dream come true for Christi; she did something she talked about doing for so long, she made a movie! How very blessed am I to have a lengthy video of her taken one day before she had her final trip to Philadelphia. I just wish it contained her incredible little giggle, but that's ok. Thankfully, that's still in my mind. This one is another I'll never forget. Christi had to get her 3rd IV in two days. She was a good sport for the first two (smile). I'll never forget how strong she was and how she was fighting their hands away from letting them attempt yet another IV. At one point she screamed, "You stick that thing in me I'm going to rip it out and stick it in you." Of course I was totally embarassed and I felt so bad for her I was crying too. The nurses told me to leave and that they'd strap her down and get it in so I had to leave. I look at this page and I am reminded Christi didn't forget that either. I'm certain if I would have thought to show this page to Christi before she died she would have been embarassed about hearing what she yelled at the nurses, but then we would have had a great big laugh over it! On this page she wrote the words herself and I had to frown as I saw her being "strapped down" picture and the frown on my face as I had to leave her. 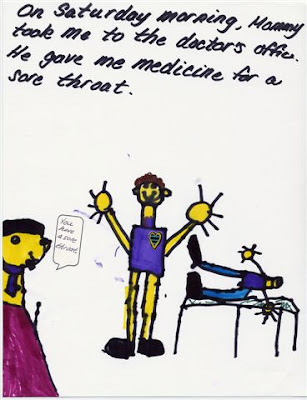 A cure for this beast really can't come soon enough; no child should have to make realistic drawings like this, ergh! It's amazing how vividly I still remember this, now over five years later. While I didn't realize it at the time, the poor little thing must have been so scared and terrified, just like we were. I remember Shayne making the two hour drive to Columbus with tears streaming down his face. I do find comfort in believing that Christi always knew that she would never be alone and that she was very loved. Like with all of the other pages, Christi did the art and I dictated her sentences. 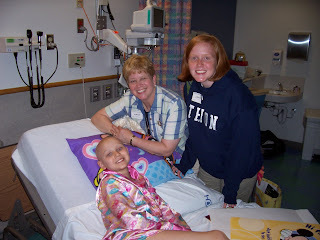 We had one of the world's greatest nurses that very first night we ever spent in a hospital - my best friend, Becky! I actually slept in an empty patient bed next to Christi's and she brought me meals, little did I know that "that life" was now my new one (except for the getting my own bed and meals part, hee hee). Now, five years later, I still rely on "Nurse Becky". I had to call her yesterday when Shayla broke out in hives all over her upper thighs. Apparently, she's also allergic to bactrium and not just penicillin. I've told myself countless times today, "I'm so glad Christi never was allergic to any medications. That would have really complicated things." Hopefully, Shayla will be feeling better soon. I'm certain she will! God is good! 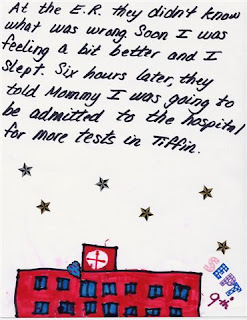 This was the next scrapbook page in Christi's series of "Being Diagnosed with Cancer" back when she was five. I'll never forget that Sunday night either. Shayne carried her out to her car seat and stayed back with Shayla. As I approached a stoplight Christi told me to go through it. (Typically, she played the "stoplight" game at that age. It went something like red lights were -2 points, yellow lights were +1, etc. When we would arrive at our destination, she'd tell me our score.) That night, she couldn't breathe and when she told me to run the stoplight I knew she was scared and in pain. Although I tried so hard for so long not to show it, so was her mom. Although Shayne and I now differ on the very end of Christi's life and if we should have told her she was dying or not, we are both very glad we kept things upbeat and positive for this little one for so long, while we hid our own pain, heartbreak and suffering from her. She would have felt bad, as if she had caused us to be sad and I never wanted her to feel that any of our misfortunes were her fault. They were not. We continued our "Girls Weekend" by overnighting with Aunt Marty and Uncle Jeff, going to church in Marion and Shayla riding Dolly. Today we ventured to Columbus to the "Fascination Destination" - COSI!! Traci didn't have to work so she met us to play (See the picture. Can you say, Gross?! "Shay" is crawling on Shayla while "CT" is on Traci.) Jenn had to work, but we made certain to check in with her too! We're anxious for Shayne to return home. 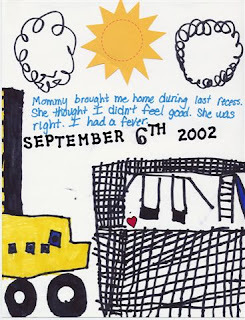 Here's the next scrapbook page in the sequence that Christi created in Sept. of 2002, age 5, shortly after diagnosis. Rumor has it, Jason was able to get the final video we have of Christi (At Aunt Marty & Uncle Jeff's where she created "101 German Shepherds" on what turned out to be her final night in the state of Ohio) digitally recorded so I will )hopefully) soon have Christi's final hurrah on the blog! Shayla and I enjoyed treating the CARE House Girls to pizza last night. Shayne and I wanted to do something to thank them for all of their work in hosting the Lemonade Stand. They were so sweet. They entertained Shayla for hours, talking, reading books to her, teaching her math tricks and even doing a dramatic reading based upon a children's book. There will be some very lucky students in the future to have these amazing and compassionate young women as their teachers! I was blessed to sit back and catch up with my friend, Lori, as she's their House Mom or Advisor or something and worked to coordinate their efforts. Please keep dear Lori in your prayers as she continues to battle very serious health issues. We are quite blessed that everyone in our family is in fabulous health. Shayne is spending the weekend with his father. While Shayne was in Toledo this week, he sat at a coffee shop and watched a gentleman roll down the street and into the coffee shop in his electric wheelchair, paralyzed from the neck down. He said witnessing that helped put everything into perspective. God is good! Happy Anniversary to a most awesome couple - my mom (Grandma Nonee) and Joe (Paw Paw). They were married ten years ago today. My mom emailed all of us this photo today and I thought it was great! Christi, just a babe, is in Shayne's arms - far left, appearing as if she's trying to get away. Our school's music teacher (Christi adored her) sewed the "Mommy & Me" coordinated dresses for the very blessed event. REJOICE! 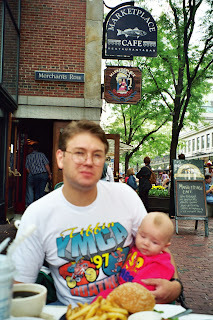 (PIC: Shayne & Christi in Boston, 1997. HAVE A GREAT TRIP MOM & JOE!) We are doing ok. Shayne is handling the recent setback with incredible grace and dignity. He is one awesome and fine gentleman! I am so very, very proud of him! For those who know what has happened, thank you very much for showering us with your love and support. As Shayne has told me countless time this week, "God's people are good. The he chuckles and says, "Well, maybe not all people, but most all!"